The iGENIE platform assures complete in-room control. 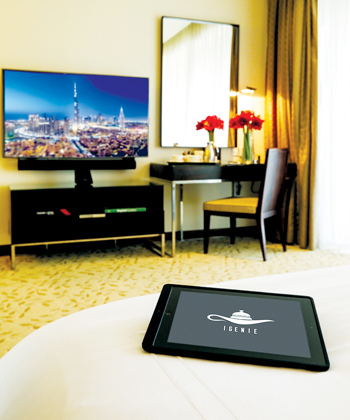 The Address Hotels + Resorts has advanced in-room automation services with the launch of iGENIE, available across all its properties. Assuring the full breadth of guest services at the tap of a finger, the new automated service will significantly enhance the guest experience providing them unbeatable convenience and value. From booking leisure and recreation appointments from the comfort of their rooms to ordering for any of the hotel services across concierge, housekeeping, engineering, to name a few, as well as exploring the internet for infotainment and entertainment, iGENIE is truly path-breaking for the region’s hospitality sector facilitated through in-room iPads provided to the guests. Assuring complete in-room control, the innovative iGENIE platform enables users to make informed decisions about restaurants, spas, business centres and other amenities. Guests can learn all about the various aspects of Emaar’s leisure attractions in Dubai and make reservations conveniently. For example, they can make bookings at any of the spas within The Address Hotels + Resorts; sign up for golf lessons and tee time at The Address Montgomerie Dubai; or purchase movie tickets from Reel Cinemas. They will also be able to experience Dubai’s most admired attractions including KidZania, Dubai Ice Rink, Dubai Aquarium & Underwater Zoo and At the Top, Burj Khalifa, allowing them to take advantage of all that is being offered, through a simple touch or swipe of the screen. With iGENIE, guests can avail of an array of complimentary entertainment options, whether it be movie, music, radio or even YouTube channels. They can also enjoy their own media using Bluetooth connection and stream their own content to the in-room entertainment system. Guests will also have a dedicated in-room mailbox for communicating with the hotel management via iGENIE. iGENIE also aids in placing orders from restaurants. Furthermore, it offers internet browsing as well as serves as a newspaper reader. An interactive video wall is also a part of iGENIE that fosters stronger customer engagement. With iGENIE, guests will also receive real-time updates on the promotions that are available at all of The Address Hotels + Resorts, allowing them to make reservations at restaurants and lounges, from their own room. Each in-room iPad is registered to an individual room, allowing the operations teams to decipher which room and guest the automated request has come from. Apart from effortlessly ordering room service, other in-room systems that can be accessed through iGENIE at the tap of a finger also include temperature, lighting and television control. The total room automation services such as temperature, lighting and TV management are currently available at The Address Dubai Mall and The Address Dubai Marina, and are being readied for roll-out across other hotels.